The land extends to about 135 acres (55 ha) of gently undulating, mainly arable land split into three fields. There are 129 acres (52 ha) of arable land and 5 acres (2 ha) of woodland. The land is classified as Grade 3 on the classification maps and has been used to grow combinable crops and potatoes in the past. The principal access is off Westwood Lane/Wanborough Hill past the Manor Farm Cottages. There is also vehicular access directly from the A31. Method of sale: The Land at Wanborough is offered for sale as a whole by private treaty. Tenure and Possession: Vacant possession upon completion. Wayleaves, easements and rights of way: The property is being sold subject to and with the benefit of all rights including; rights of way, whether public or private, light, support, drainage, water and electricity supplies and other rights and obligations, easements and quasi-easements and restrictive covenants and all existing and proposed wayleaves for masts, pylons, stays, cables, drains, water and gas and other pipes whether referred to in these particulars or not. A public footpath crosses the land in the south eastern corner. Basic Payment: The entitlements to the Basic Payment Scheme are included in the sale. Designations: The property lies part in the Surrey Hills Area of Outstanding Natural Beauty. Local authority: Guildford Borough Council , Surrey County Council VAT: Any guide price quoted or discussed is exclusive of VAT. In the event that a sale of the property, or any part of it, or any right attached to it, becomes a chargeable supply for the purposes of VAT, such tax will be payable in addition. Health and safety: Given the potential hazards of a working farm we ask you to be as vigilant as possible when making your inspection for your own personal safety. Viewing: Strictly by confirmed appointment with the vendor’s agents, Strutt & Parker, on . 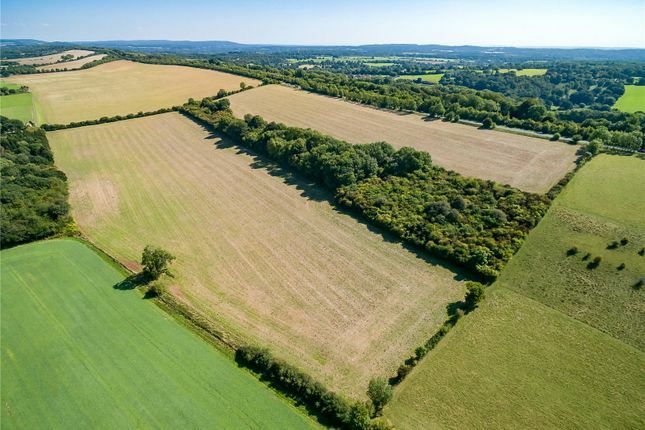 The Land at Wanborough is located on the north side of the Hog's Back (A31) within the Surrey Hills Area of Outstanding National Beauty. The land lies about 4 miles west of Guildford and 5.5 miles east of Farnham. The land is accessed from Westwood Lane which gives direct access onto the A31 Hog's Back and the A3. Property descriptions and related information displayed on this page, with the exclusion of Running Costs data, are marketing materials provided by Strutt & Parker - National Estates & Farm Agency, and do not constitute property particulars. Please contact Strutt & Parker - National Estates & Farm Agency for full details and further information. The Running Costs data displayed on this page are provided by PrimeLocation to give an indication of potential running costs based on various data sources. PrimeLocation does not warrant or accept any responsibility for the accuracy or completeness of the property descriptions, related information or Running Costs data provided here.